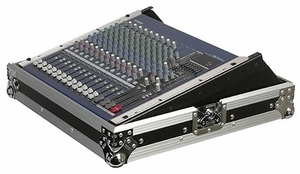 Transport your 19" rackmount mixer in style with our Flight Zone mixer case. Holds mixers up to 8 spaces tall. Depth clearance is 2.875" towards the front and 6.5" at the peak. Removable lid serves as an elevated base. Product Dimensions: What does this mean? Width Height Depth 8.5" 17" 22.5"